The Haunted is one of the newest Swedish über-bands, rising from the remains of At the Gates. At the Gates was one of my favorite bands, and their final masterpiece Slaughter of the Soul is widely considered to be one of the best metal albums ever made. So what kind of sound do you expect when you take three former At the Gates members and add a new vocalist and guitarist? I’m a fan of anything Swedish, and this album does not disappoint! 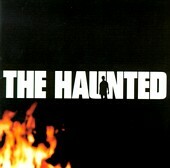 The Haunted is not a rehash of old At the Gates; I wouldn’t even consider it death metal. It’s more like thrash, with fast chunky riffs and speedy (but not blast-beat) drumming. Dolving (the vocalist on the CD whom they’ve since replaced, along with the drummer) is not a death metal vocalist. Many people complain about the vocals, arguing that they sound “trendy.” In my opinion the music speaks for itself; it’s definitely not poser-friendly. Thrash this brutal hasn’t been done since the late 80’s. I can honestly say that this album is damn-near perfect (at least, it’s the most perfect thrash release in years). I have only a few minor complaints. Some of the lyrics are cheesier than Kraft “Cheese and MacaroniÔ” and sound like something off a Pantera CD (ie. “Check again motherf*cker! You’re in the real world now.”). Bad lyrics are one of the defining characteristics of metal though, so it’s a pretty minor complaint. Occasional cheesy lyrics aside, this album rules and if you’re a fan of thrash you need to get it!